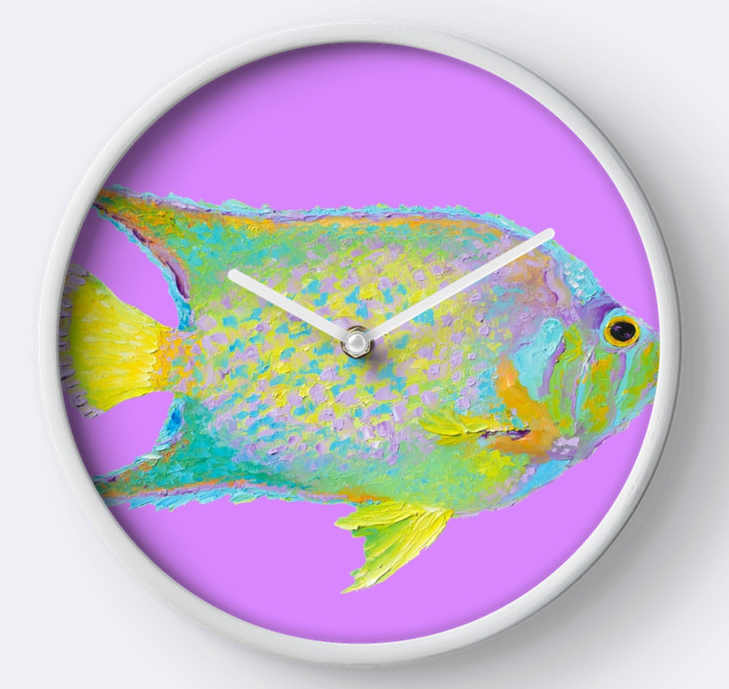 Tropical Fish painting is available as wall art, clock, tote bag, throw pillow, mugs, greeting cards, phone case etc. 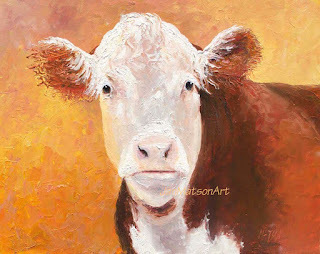 An oil painting of a Red Angus Cow on a gold background for kitchen decor, country kitchen or cattle ranch. 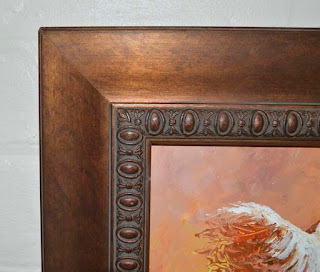 Original oil painting on stretched canvas 24" x 12", sides measuring 1 1/2", ready to hang. 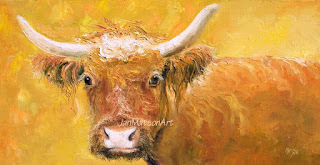 This original oil painting is also available as a much larger print, up to 60" wide if you prefer. 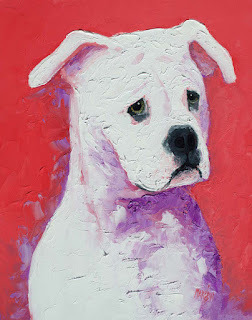 Original Oil painting on stretched canvas 24" x 20" x 1 1/2". ( 61cm x 51cm) It is complete and ready to hang with d rings and wire. 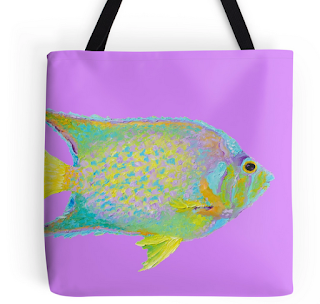 The image is continued on the sides and is available from my Etsy Art store. 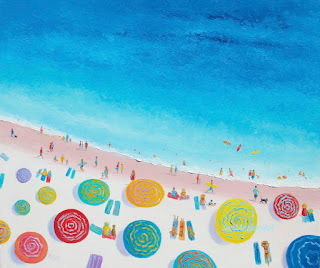 Bright and colorful "lollipop" umbrellas line the seashore. 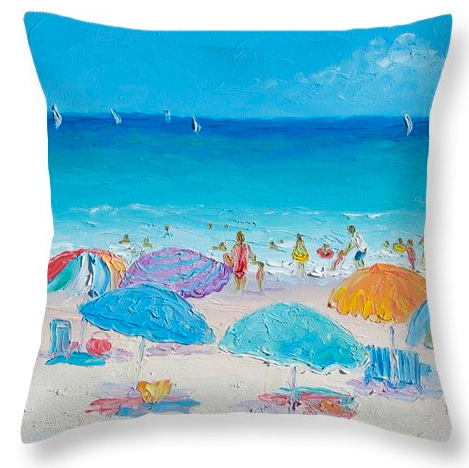 Fun for coastal decor or a reminder of perfect summer days at the seaside. This is an original oil painting on board available from my Etsy Store. 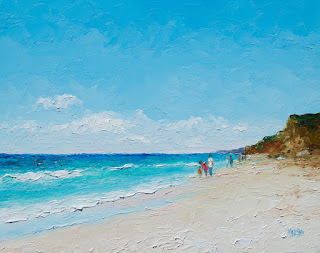 This little impressionist beach painting was painted in oils mostly using a palette knife. 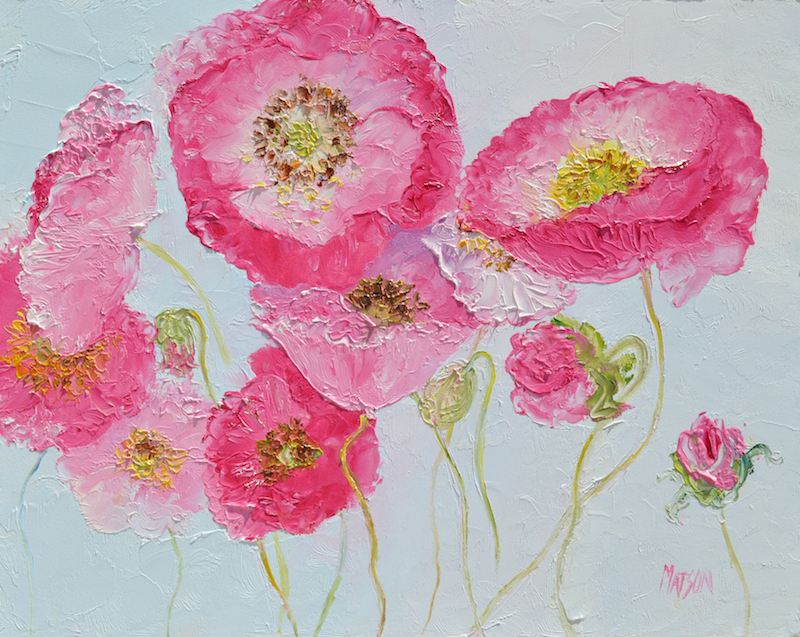 Dancing Pink Poppies will brighten your day! 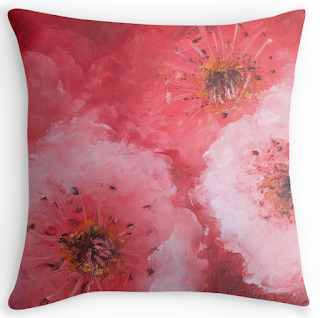 Bright pink poppies is available as canvas wall art, tote bags, round towels, phone cases, throw pillows and other products. 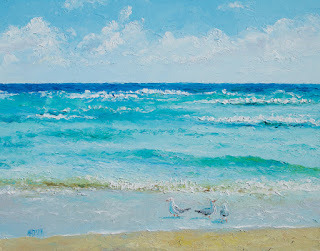 Ocean Breeze, a seascape oil painting for coastal decor. A relaxing ocean painting for beach house decor. 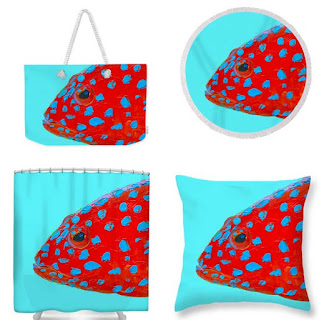 This ocean print is available canvas wall art and matching beach pillows, beach bags and beach towels. This woolly sheep painting (Gabriel) is complete with wire and d rings, so is ready for hanging. 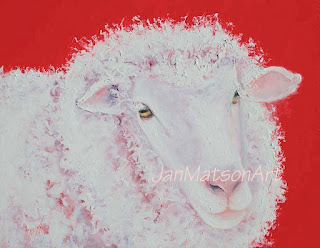 Sheep Oil painting on stretched canvas 23.5" x 17.75", sides measuring 1/2" and is available from my Etsy Store. 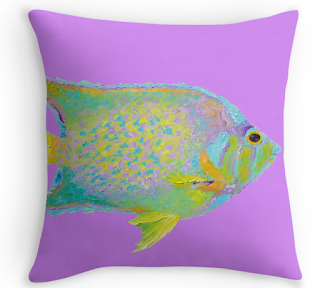 Gabriel is also available as a canvas or framed print with matching throw pillows, tote bags, phone cases and other products. 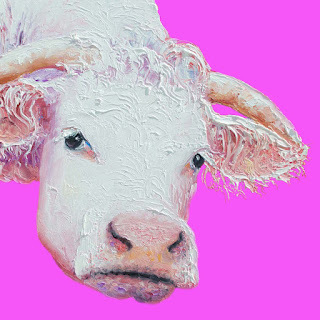 Browse more animal prints from my Animal Paintings Gallery. 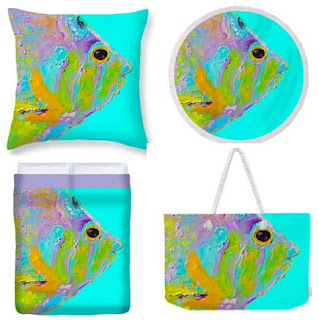 Canvas art prints including matching throw pillows, tote bags, phone cases, duvet covers, round towels, t-shirts etc. 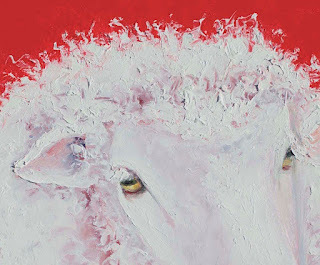 The original oil painting of Woolly Sheep on stretched canvas, measuring 28" x 14" is available from my Etsy shop. 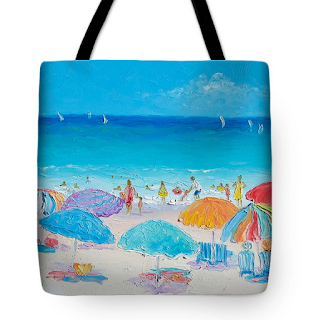 Original beach scenes are also available as beach towels, tote bags, beach bags etc. Article in Crowdink "Jan Matson’s Coastal and Beach Artwork is Our Happy Place"
I'm very excited to share this article with you:http://crowdink.com/editorpick/jan-matsons-coastal-beach-artwork-happy-place/ I have been chosen by Crowdink to be their Artist of the Week! We all have a happy place. And for many of us, that vista includes waves lapping at silver sands, smooth shells, an occasional umbrella, and lazy clouds. 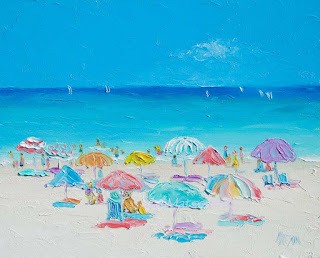 What better way to make your home a happy place than to fill it with art that draws up the nostalgia of a day at the beach? 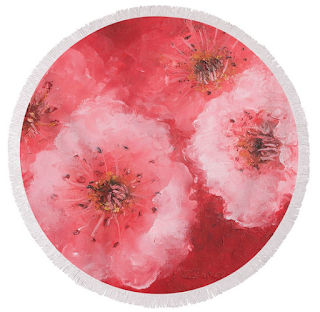 Original cherry blossom design on throw rug, phone cases and many other fun products. 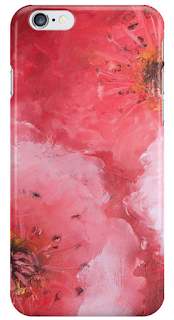 Choose the original cherry blossom design in over 30 products. 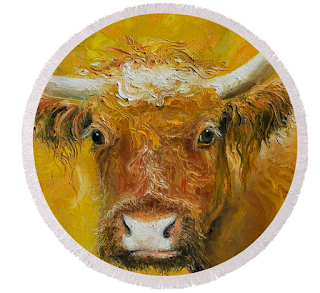 An original horned cow oil painting on this round towel or couch throw. 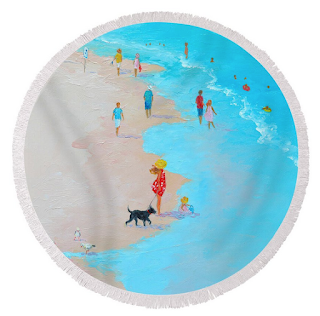 Our round beach towels are 60" in diameter and made from ultra-soft plush microfiber with a 100% cotton back. 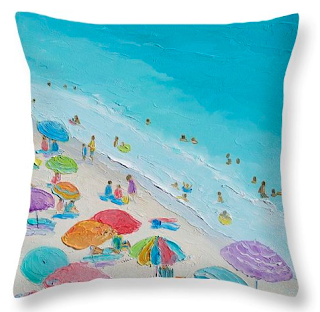 Perfect for a day at the beach, a picnic, an outdoor music festival, or just general home decor. This versatile summer essential is a must-have this season! 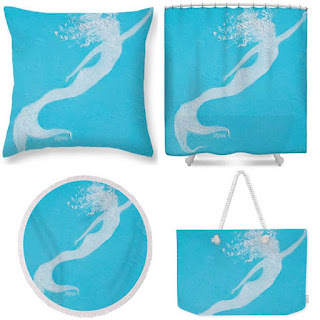 There are hundreds of original designs for your round beach towel or couch throw rug. 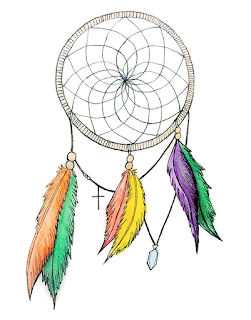 This Indian Dreamcatcher image is available is available as t-shirts, phone cases, prints, mugs, tote bags, throw pillows, duvet covers etc. 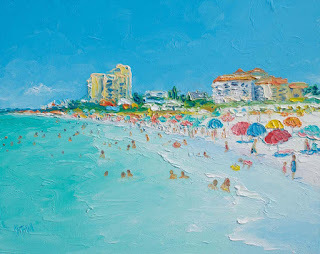 This beach painting was painted with a palette knife for a thickly textured artwork. 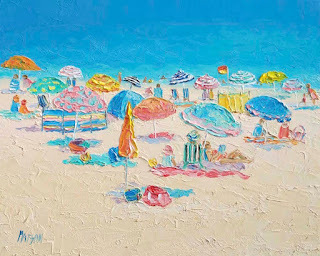 Beach art to remind you of relaxing days at the seaside! 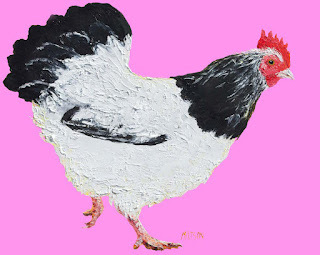 Chicken painting available as canvas prints, framed prints, throw pillows, tote bags etc. 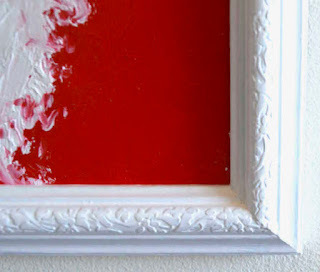 Looks great framed with a mat board and a narrow black frame! 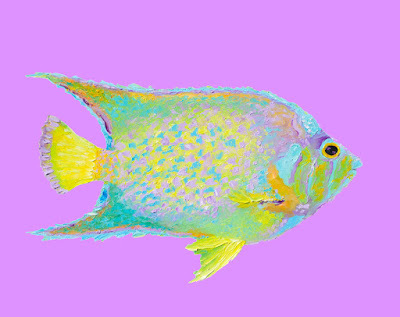 This chicken is sure to add color to your life! 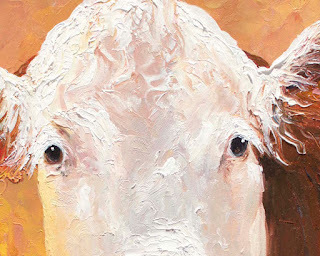 Sheep Oil painting on stretched canvas 23.5" x 17.75", sides measuring 1/2". 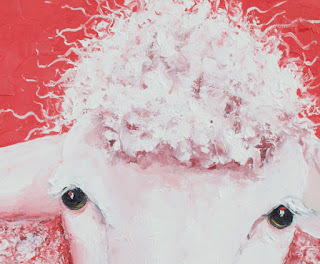 An original sheep painting on a stretched canvas. "Gabriel" is on a bright red background and is sure to add a talking point in your kitchen! 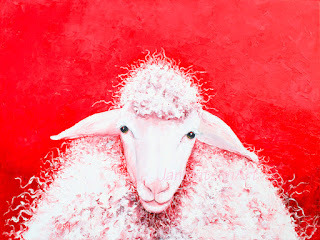 This woolly sheep painting is complete with wire and d rings, so is ready for hanging. 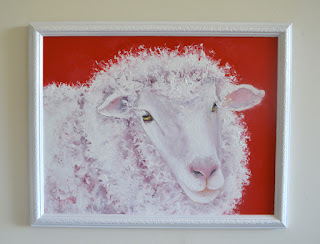 Sheep art measures 13" x 10", white wooden frame width is 3/4". 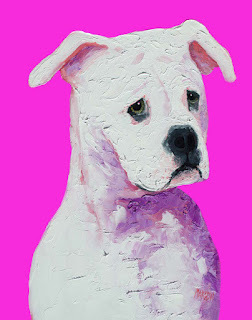 Total measurement is 14.25" x 11.25". 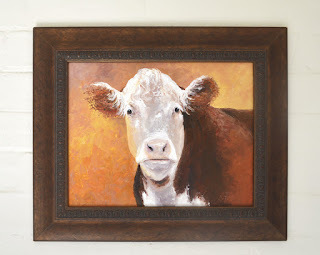 Original Framed oil painting is 19" x 16" and is ready to hang. An oil painting on board 10" x 8" unframed. 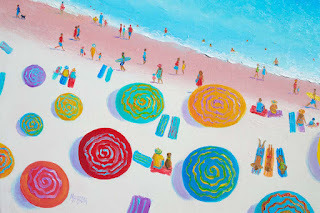 Bright and colorful beach umbrellas for tropical or coastal decor. 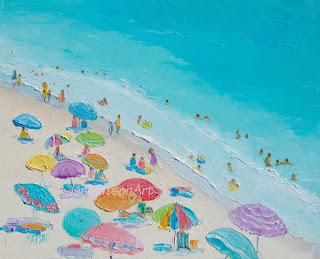 Etsy Art - Beach painting "Summer Love"
An original impressionist oil painting of a crowded beach scene. Size 10" x 8" on board, unframed. 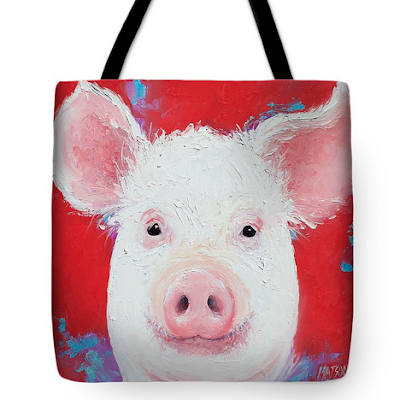 This happy pig design is also available stretched canvas prints, acrylic, metal, framed, posters, phone cases, greeting cards, duvet covers and throw pillows. This Robin was painted in oils with a palette knife for a textured artwork. Bird prints are available as stretched canvas prints, acrylic, metal, framed, posters, phone cases, greeting cards, duvet covers, tote bags, and throw pillows. 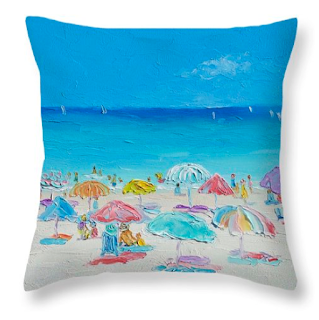 Coastal pillows with tropical colors and original beach designs. Also available as canvas art prints, throw pillows, shower curtains, phone cases, and duvet covers. 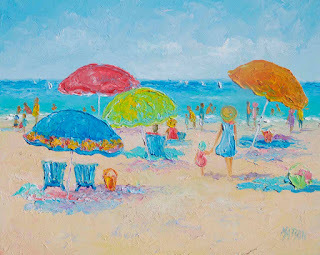 Beach Decor in bright tropical colors.